New Boston was a village that was practically erased from existence to make room for the 1940s Birch Hill Dam flood control project. 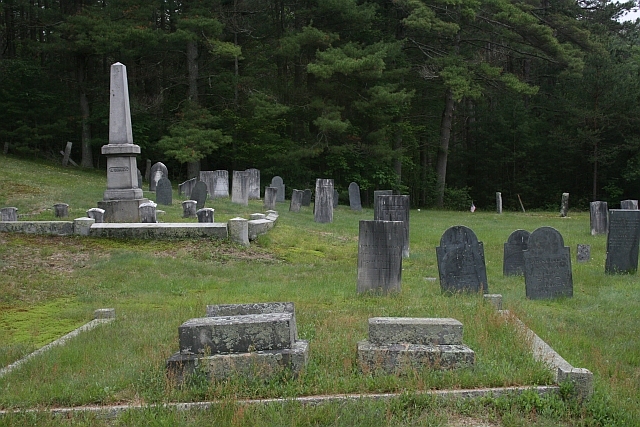 This cemetery, which lies within the Otter River State Forest, is just about all that is left of the town. Legend has it that it is haunted, and if you back up to a particular tree, you can see an angry figure hanging from it. I have been to this cemetery on a number of occassions and have found it to be one of peace. What gives this place an ominous feel is all of the satanic graffiti that vandals have either painted on the ground or on headstones. It’s a shame, really. I have a great discernment for the spiritual side of things and feel nothing here is haunting at all. I grew up in Winchendon / Fitzwilliam. I spent many teenage nights at this cemetary in the 80’s. I’ve also found it very peaceful. I also liked the fact that in my days we weren’t out defacing headstones, all the other crap that goes along with it. There is a family rumor about that cemetary. First my great grandfather was someone called the “Goat Man” he’d walk with goats and items from town to town. Later when he passed supposedly he’s buried in that cemetary. I’ve got no idea if either of those stories are true and no way to find out. I too have lived in Fitzwilliam for the last 35 yrs, and have never felt anything beyond a kind of melancholy in this place, the kind of quiet sadness you feel in any burial ground. My understanding is that there used to be a village nearby that was dismantled to make way for the flood control project. Here’s a photo I took of the place June 21, 2009. I’m working on our genealogy. It’s said that my great great grand father drowned in Winchendon around 1860. I wonder where he’s burried. Do any of you see Bridge on tombstones? Fred or Francis. Or Sara.